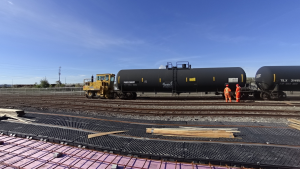 Parkland Fuel Corporation’s rail terminal facility in Hamilton is a great example of how Cando Rail Services optimizes its customers’ networks. Parkland came to Cando in 2014 looking for a way to reliably supply its growing network of retail fuel stations in southern Ontario. As one of North America’s fastest growing independent marketers of fuel and petroleum products, and Canada’s largest fuel retailer, Parkland was looking for opportunities to improve its product sourcing options. It also wanted to enhance supply reliability in the southern Ontario market, one of the highest demand areas in Canada. With Ontario pipeline and refining capability at capacity, sourcing product by rail became a viable solution. Fuel delivery by rail typically means building a fuel distribution terminal or bulk plant with large storage tanks, along with equipment to blend it to exacting specifications. Cando came up with the concept of a modular and scalable rail direct-to-truck terminal that minimized initial start-up costs and project lead time while at the same time, not compromising on environmental protection and safety features. Key to achieving success for this type of project is Cando’s ability to recognize and find a suitable location for a terminal facility. Working with Parkland, Cando sourced the land and helped work out the details of the land acquisition and agreements. Parkland then contracted with Cando to design, build and operate the facility. To successfully execute the design and start-up of this facility, Cando supplemented its in-house engineering, transload logistics, rail and design expertise by building a team of experts from companies across Canada. Cando worked with civil and environmental engineers to ensure the site would meet or exceed all necessary standards, including complying with Ontario’s strict new regulations regarding spill prevention, air emissions and safety. Throughout construction, Cando worked closely with regulators to ensure the finished facilities complied with legislation. Working with long-term supplier, Hall Technologies of Calgary, Cando helped develop and design customized modular transload units that can work both as straight product transloaders, or mixed product blenders. This equipment is among the most advanced of its kind for this type of operation, and currently the only direct rail to truck ethanol blending equipment being used in Canada. 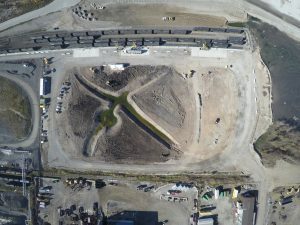 The resulting rail terminal facility is the most advanced facility of its kind anywhere in Canada, which was one of the objectives at the outset. The team also added inventory control features such as RFID badges allowing for automated bill of lading control. It took less than 12 months to move from initial concept to Phase I trial operations in December 2015, and less than 12 months after that to move to full operations in November 2016. To date, operations and throughput have met or exceeded expectations, and this has resulted in a further Phase III expansion which will come online in summer 2017. In basic terms, transloading is the process of transferring a shipment from one kind of transportation to another in order for the goods to reach their final destination. Terminal Services take transloading to a new level beyond simply emptying railcars into a truck. Terminal Services include custom railcar switching, product blending, inventory management, and additional equipment that allows for simultaneous multi-truck and multi-product loading. Cando has the equipment and expertise to offer blending, direct from railcar to truck for retail delivery, including blending of ethanol and gasoline to make ethanol blended gasoline, and blending of diesel and biodiesel to make various biodiesel blends. Cando’s transloading equipment eliminates the intermediate step of transferring products to a blending tank or other blending vessel. This highly efficient system reduces need for capital investment into permanent physical infrastructure such as above ground storage tanks. It also speeds the delivery of the facility from conception to operation. 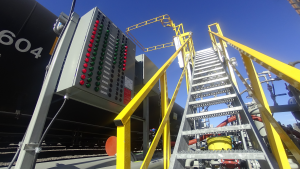 Read more about how Cando helped design and build the Parkland Fuel Hamilton facility.